Three domino colors are available: traditional ivory with black dots, green with white dots, and red with white dots. The Vinyl Dominoes Cases are available in black only. Each Domino Case measures 7-1/4" x 4-1/4" x 3/4" when closed. 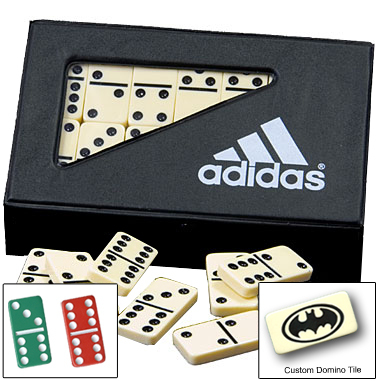 The individual Domino Tiles are 1-15/16" x 1" x 5/16".